BEIRUT -- Syria activists and rescue workers say at least 11 people have been killed and a hospital badly damaged and rendered unusable in regime airstrikes on the opposition-held northern province of Idlib. 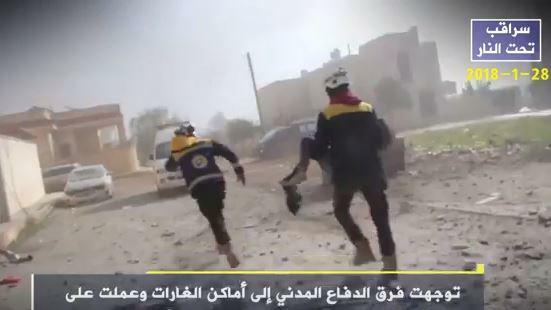 The local White Helmets rescuer group said the airstrikes on Monday hit Idlib's largest vegetable market in the town of Saraqeb, where 11 people were killed. The Syrian Observatory for Human Rights confirmed the attack and said a local hospital was also hit by the Syrian regime strikes, putting it out of service. The activist Idlib Media center posted photographs of the exterior of the damaged building. The violence has overshadowed a peace conference hosted by Russia between the Syrian government and the opposition, which is scheduled to open on Monday. A day earlier, at least 17 civilians were killed in airstrikes in Idlib. Syrian dictator Bashar Assad's forces have a history of targeting hospitals and field clinics in rebel-held territory, and allied Russian aircraft have been accused of doing the same. Both Syria and Russia deny deliberately targeting civilians.